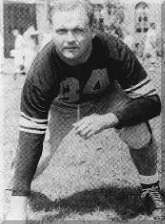 William Patrick McPeak (July 24, 1926 – May 7, 1991) was an American football player and National Football League coach. Born in New Castle, Pennsylvania, McPeak was a star defensive end for the University of Pittsburgh. He was drafted by the Pittsburgh Steelers where he played from 1949 to 1957. During the final two years of his playing career he also became an assistant coach for the team. In 1959, McPeak joined the Washington Redskins as an assistant under head coach Mike Nixon. After Nixon's dismissal following the 1960 NFL season, McPeak was promoted to head coach, and remained in that position until 1965. Although the Redskins did not have a winning season under McPeak (he had an overall 21-46-3 record as head coach), during his tenure the team acquired players (many of whom would become Hall-of-Famers) that would eventually play a part in their later winning years such as Sonny Jurgensen and Bobby Mitchell, and draft future stars such as wide receiver Charley Taylor, tight end Jerry Smith, center Len Hauss, and linebacker Chris Hanburger. In 1967, McPeak joined the Detroit Lions as an assistant coach, a position he held until 1972 when he moved on to the Miami Dolphins to replace Howard Schnellenberger who became head coach of the Baltimore Colts. His tenure in Miami would last for only two seasons due to complications suffered after a stroke, which he spent several years recovering from. He would later join the New England Patriots after returning to health, where he became director of scouting for twelve years. McPeak died of a heart attack on May 7, 1991 at the age of 64 at his home in Foxboro, Massachusetts. ↑ "Bill McPeak". pro-football-reference.com. Sports Reference LLC. Retrieved 22 August 2014.